There are some areas of the country where it rains and snows enough during the year that the people living there don’t have to worry about using water sparingly. In some areas it can rain anywhere from 2-3 days straight to weeks straight. But this isn’t the case in many parts of the country, especially in the states that have desert. In these areas, they consider it lucky when it rains more than once or twice in month during the summer. Also in these areas they have to obtain water in different ways than they do in areas that have high moisture. One of the ways that people get water is from wells that have been dug up. Sometimes you have to dig pretty far underground in order to find water. Some wells are so deep that they require a ladder or other large thing to get in and out of the well. In order for this water to be useful, it needs to get from the bottom of the well to the surface where it will be used for many different purposes. Throughout the years people have come up with different ways to get well water out of the ground to water crops, lawns, and to use in the home. Some of the earlier methods of getting well water involved big apparatuses and complicated systems. Through innovation and design, these huge water distributing machines have become much smaller and more powerful. 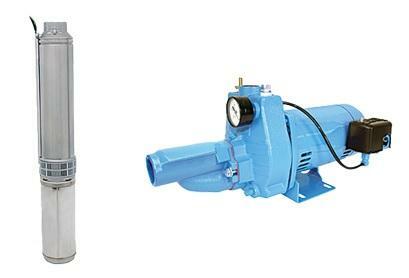 It was through these innovations that the jet pump and submersible pump came on the market. Using different designs, these pumps create the power necessary to move water from one place to another. Returning to the example of well water, these pumps draw the water from underneath the ground and bring it up to the surface, using fewer parts than what was necessary many years ago. The beauty of many of these pumps is that they are submersible-meaning that they can function and be installed underneath the water. This can be useful when there is a lot of water that collects after a storm or when the snow starts to melt. The water can cover the pump and you don’t have to worry about it being ruined. Jet pumps can be used for other purposes as well. If you live in a more rural area and you have a lot of grass or fields to water, a jet pump can help take water from the main line or other main source of water and transfer it to the place that needs to be watered. As water lines extend out further, the water pressure will decrease until it comes to a point where the pressure won’t be enough to make sprinkler heads pop up-to name one example. Jet pumps can help increase the pressure so that the sprinkler heads can pop up and water the areas they need to water. If you need to get water from a well, consider getting a jet or submersible pump. Visit https://www.plumbersstock.com/category/181/jet-pumps/ to find the pump you need!